In the Traverse City and Leelanau County area, folks are fortunate to have more than a few tree services to choose from. While all of them perform mostly the same services, it’s how they are performed that should help you determine which company is the best fit for you! Owner Operated: The same individual who performs your job quote will be on site leading the team to complete your tree work, seeing to all the details you request. Local Service: By limiting our working area to Leelanau, Grand Traverse, and Benzie Counties, we can focus on providing our customers and neighbors with only the best and most personable service we have to offer! High Retention Rates: Approximately half of Carlson Tree Service’s jobs are for return customers. Another quarter are referrals from our satisfied customers. Adequately Insured: Make no mistake, tree work is inherently dangerous. Because of this, Carlson Tree Service carries both Liability and Worker’s Compensation Insurance, ensuring our customers a zero liability experience. Efficiency: Most tree service job quotes are generated as a function of overhead and expected on-the-job time. 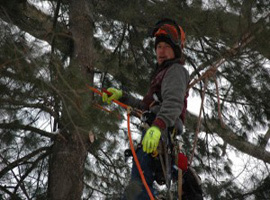 Carlson Tree Service draws on three generations of practice and consistency to offer these cost estimates accurately, factoring in low-overhead climbing techniques and delivery by skilled trade professionals. Light Hands on the Land: You don’t have to hire a small crane to trim your back yard trees! Carlson Tree Service is proud to fill a unique niche in the local area by offering lower impact alternatives which are frequently less costly than heavy machinery. 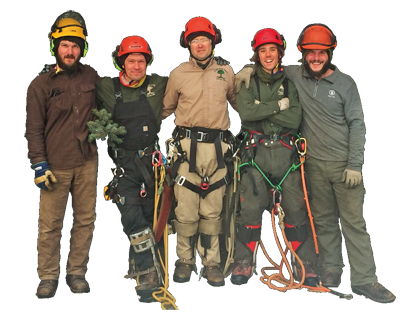 Adequately Equipped: Although our specialty is climbing, Carlson Tree Service does utilize a 60-foot bucket truck and a hydraulic log grapple in situations where these are the most appropriate tools for the job. Proudly serving Northern Michigan, including Leelanau, Grand Traverse, and Benzie Counties and the communities of Lake Leelanau, Traverse City, Cedar, Lake Ann, Leland, Northport, Suttons Bay, Acme, Elberta, Beulah, Elk Rapids, Empire, Frankfort, Glen Arbor, Honor, Interlochen, Thompsonville, and Williamsburg, Michigan.